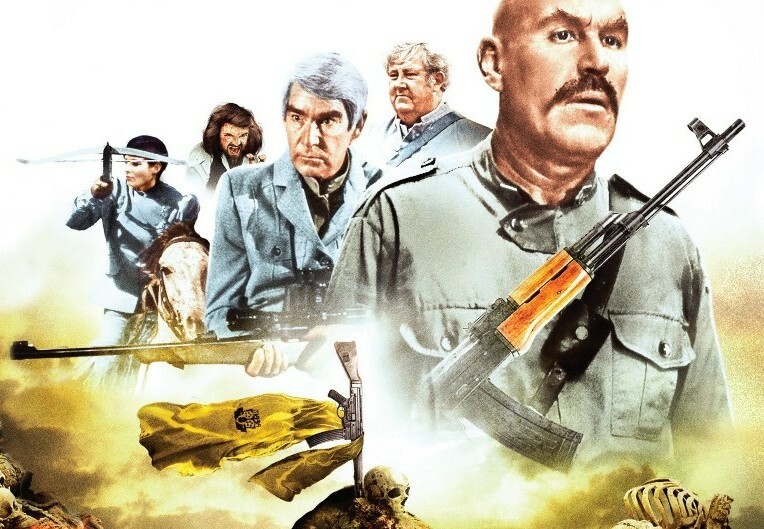 Digi-Schlock: TURKEY SHOOT (Severin Blu-Ray) – Schlockmania! Severin has shown an interest in vintage Aussie genre fare in the last year or so, putting out handsome-looking blu-rays of Patrick, Dead Kids and Thirst as well as the fun Ozsploitation Trailer Explosion on DVD. They made another move into this territory via a new blu-ray of Turkey Shoot (a.k.a. Escape 2000), one of the most raucously entertaining films in this vein. The result is a worthy hi-def upgrade that also includes a strong collection of extras old and new. Things start beautifully with a nice new HD transfer that gives the film an appropriately detailed and colorful image that captures all its gritty details nicely. The original mono mix for this transfer is presented in DTS form and sounds pretty robust for a vintage mix, bringing some nice depth to the score’s frequent analog synth shadings. Turkey Shoot had previously enjoyed a good DVD special edition release from Anchor Bay and fans will be happy to know the extras from that disc are carried over here. The first of these is a solo commentary track by Brian Trenchard-Smith, who offers a low-key but witty stream of comments that mix scene-specific observations with a frank discussion of how he had to rework the film on the fly when a big chunk of financing dropped out at the last moment. He talks about why he chose to use camp humor and bloody effects, discusses his cast’s contributions and isn’t afraid to criticize the parts of the film where the effects or staging don’t work to his satisfaction. It’s an illuminating listen for the film’s fans. Also carried over from the old Anchor Bay DVD is a featurette called “Blood And Thunder Memories” and a 10-minute interview with Trenchard-Smith. The featurette is an uncompromising affair in which castmates Michael Craig, Lynda Stoner and Roger Ward offer their candid memories of the film and the shoot. They’re complimentary to Trenchard-Smith but all address the budget problems and the eccentricities of the lead actors. Stoner in particular is vicious in h er disdain for the finished product. The Trenchard-Smith interview has a weary tone to it, with him remarking that the film wasn’t good for his career and he tried to be a “good soldier” in bad circumstances. It’s interesting to note that these pieces were early ventures for Mark Hartley, who would go on to do the well-regarded Not Quite Hollywood documentary on Australian genre fare. Severin has added two impressive new extras to the mix. The first is “Ozsploitation Renaissance,” a 26-minute roundtable chat that features Trenchard-Smith, producer Antony Ginnane and cinematographer Vincent Monton. They discuss how they made their way into the business (including some interesting discussion of the Fantasm films) before Ginnane and Trenchard-Smith move into a discussion of Turkey Shoot and how it was shaped by its budget woes. All of the men express a charming fondness for the “wild west” days of the Australian film business. The other new extra is the most substantial entry in the bonus features: 77 minutes of extended interviews from Hartley’s Not Quite Hollywood. Trenchard-Smith, Ginnane, Ward and Stoner all return here plus new inclusions like Steve Railsback, Gus Mercurio and FX man Bob McCarron. The familiar faces offer more developed versions of anecdotes they tell elsewhere on the disc, periodically adding in new details (example: Stoner reveals how Trenchard-Smith was caught in a battle of egos between Ginnane and another producer, David Hemmings). The most inte resting stuff comes from the new faces: Railsback asserts that the missing budget might have been wasted at the racetrack by the producers, Mercurio tells some funny stories about his shower scene with Olivia Hussey and McCarron reveals just how dangerous the film’s stunts and effects actually were. A trailer and an alternate titles sequence close out the extras. The trailer is an exploitation classic, playing up the blood and the sleaze in a package loaded with grindhouse-style spectacle. 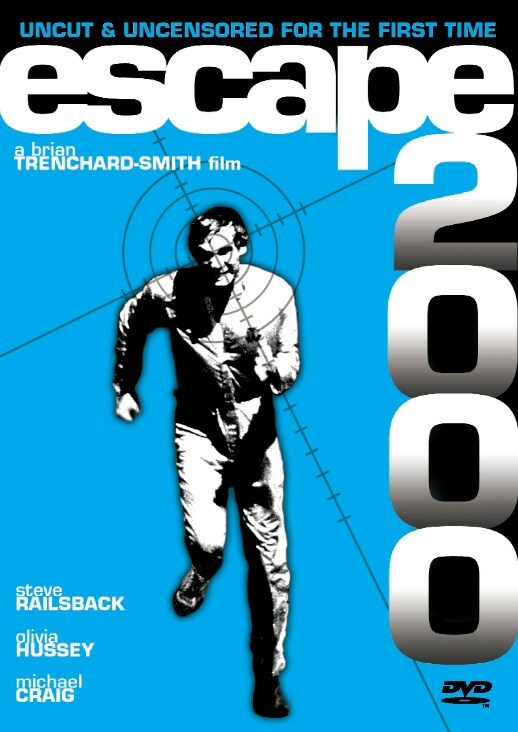 The alternate title sequence is almost identical to the one in the film but uses the Escape 2000 title card seen in the U.S.
All in all, this is the kind of swell update for an old exploitation favorite that Severin does so well. Ozsploitation fans will want to pick it up, particularly with the new extras it offers. 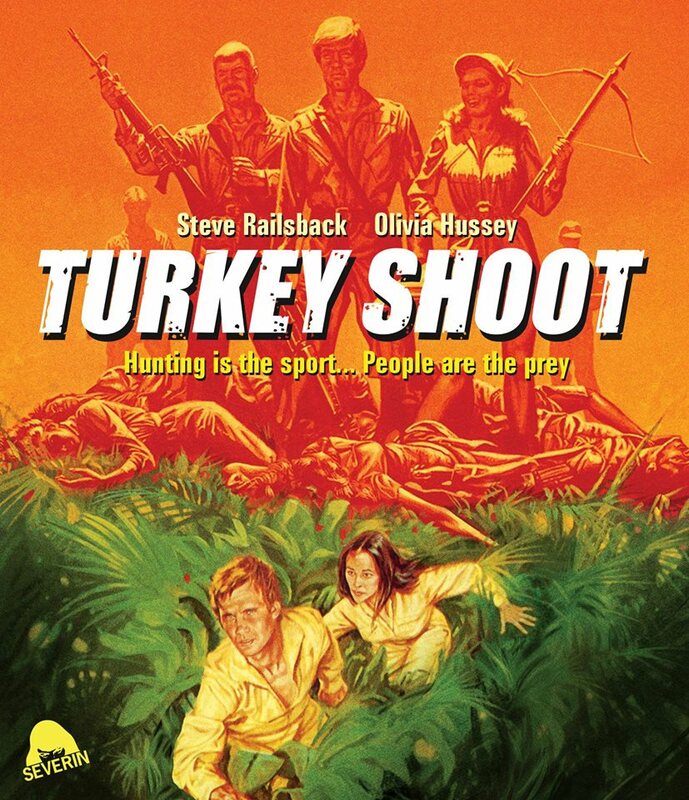 To read Schlockmania’s film review of Turkey Shoot, click here.